Come in from the cold and get in on some unforgettable family fun! USTA Eastern will host a 10 and Under Tennis clinic using the QuickStart tennis format with Patrick McEnroe at the Intrepid Sea, Air & Space Museum on February 23, 2012. QuickStart is designed around the same concepts as Little League Baseball and other youth sports such as soccer and basketball, all of which use equipment and field/court sizes scaled to the size of young children. The scaled-down equipment and smaller playing fields allow kids to achieve success the first time out-and sustain that success as they continue develop and refine their skills. There will be exciting raffles every hour including the chance to win tickets to the BNP Paribas Showdown, kids' size tennis racquets and much more! Take part in more activities with representatives from the Rangers, Mets, Knicks, Liberty and others! Mr. Met will be there too on this Sports themed day! 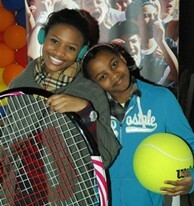 All Week (February 18-26) - USTA Members Kids Go Free! Get one free child ticket (a $19 value) with the purchase of one adult ticket! Use code USTA-KW-12. *Must bring a copy of this offer from newsletter or print this web page to redeem your prize. The Intrepid is located at Pier 86 (46th Street and 12th Avenue) in Manhattan. It is open Tuesday through Sunday, Tuesday - Sunday, 10 am - 5 pm. For more information, check out the museum's website at http://interepidmuseum.org.